My fiancé and I made an overnight trek up Whitney on this past Thursday/Friday. Now, I’ve got a burning question... About a mile up the trail after leaving Whitney Portal, we heard a really deep “womping” noise. The noise came in sets of 5 or 6, and we’d hear it every 10 seconds or so. It sounded so deep it’s hard to believe it was a bird, but it could be. We heard it in the same area on our way up and down the trail. Any ideas?? Here's a YouTube video with the sound. Unfortunately, the sound is so deep that most microphones won't pick it up, and most computer speakers won't play it. I can't hear the sound using my usual computer speakers, but put on the ear buds or earphones, and you will hear it. The sound is so common in the Sierra, but many people don't realize it is this bird. I have some friends who were hiking the Pohono trail in Yosemite -- it starts at the Tunnel View parking lot. They started up the trail, and then heard the sounds of that bird. They were just sure it was a bear making some sort of warning sounds, so they turned back and hurried back to the car. It ended their hike!!! This is the best video I could find of the sound, but it doesn't sound nearly as loud here -- even with headphones -- as it does on the trail. This is how the male appears. The female is all speckled and gray -- camouflaged. The pics below are mine. (click for larger view). 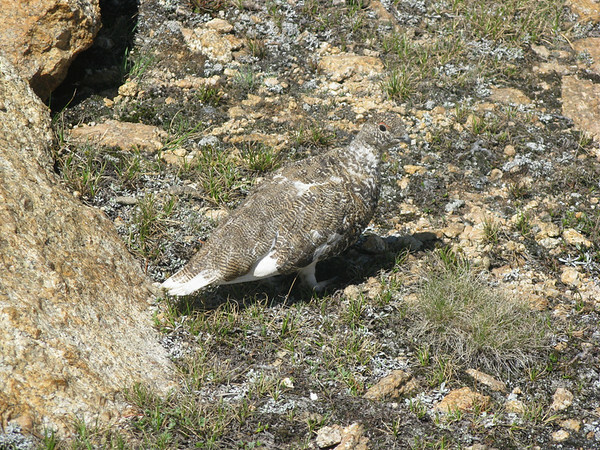 This one was shadowing/harassing a hen in the trees and bushes at the base of the Half Dome subdome area. As he chased her (walking slowly), he was hissing. 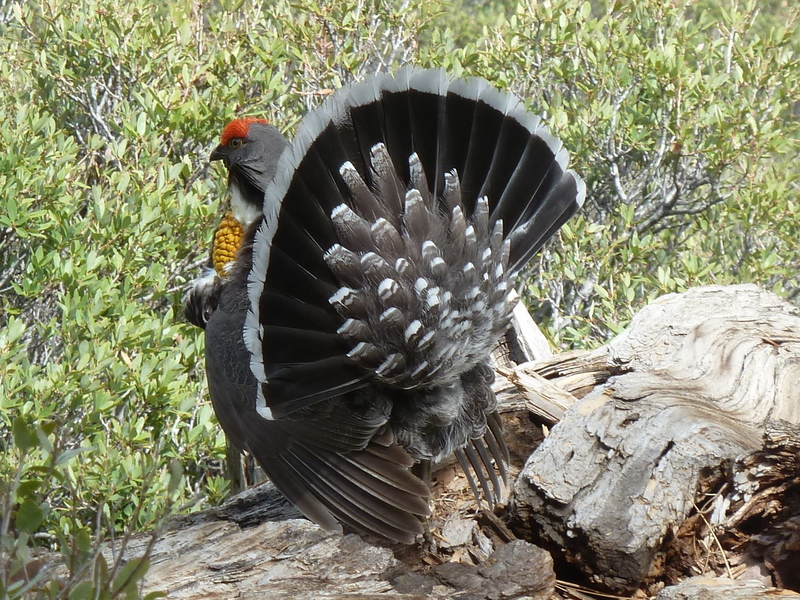 Here's a hen: Above Cathedral Lakes in Yosemite. Amazing! I was so curious. It’s crazy that a bird that size can make such a deep sound. I hate to grouse about birds, but if you walk-up on them and they decided to fly away when you are 2 feet away, it sounds like a grenade. That's the fowlest noise they yet make. And if you are not careful, they may turn on you and attack especially the male. There are actually two possibilites here. 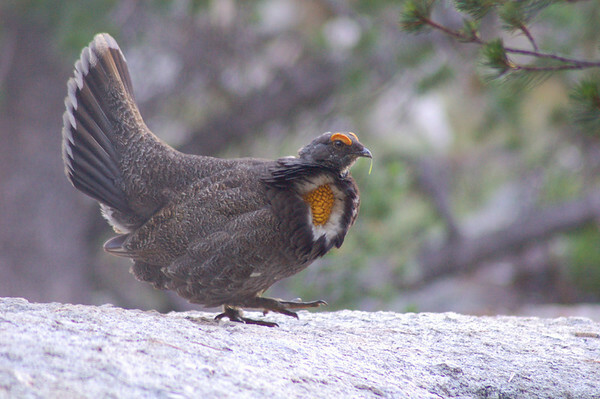 The description of a "womp" more closely fits the ruffed grouse, a shorter, lower and more rapid note that sounds like what it is" the whomp of wings, like a muffled drum. The blue grouse makes a longer, higher and more musical note, less rapid and fewer in each series like something between a bullfrog and a great horned owl. Ruffed is more common the the lower reaches of the eastern sierra, but its possible. Generated in 0.154 seconds in which 0.146 seconds were spent on a total of 14 queries. Zlib compression disabled.